Do you love to give unique gifts to friends and family? 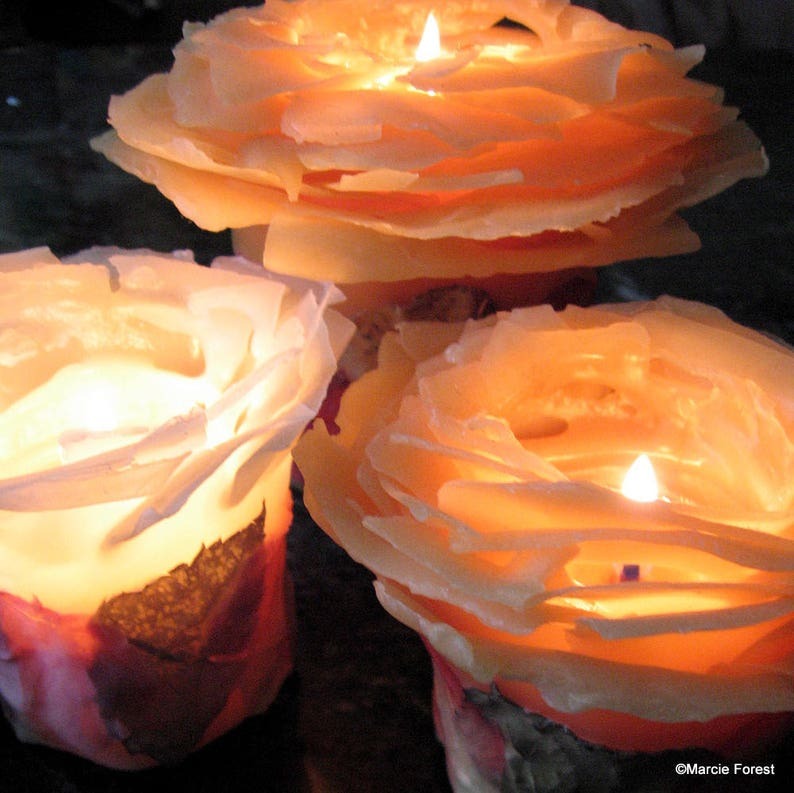 Buy a set of 2, 3 or 4 of my unique beeswax rose candles and be ready for oohs & aahs. Handcrafted by me at my studio in California, each candle I make is a work of art - no two look exactly the same. Sent beautifully gift-wrapped in individual gift boxes ... be prepared for last minute needs by keeping some on hand for all occasion gift-giving! These 100% pure beeswax candles are handmade to order in your choice of natural white or honey amber, adorned with rose petals and leaves. Simply exquisite in any decor. "This candle is the loveliest candle I've ever seen. I've ordered from here before and the quality and artistry is beyond compare. Purchase with total confidence from this shop." 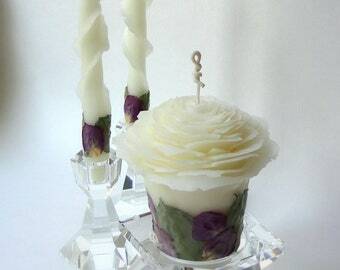 "Absolutely gorgeous, finely crafted candles - I purchased them as a gift and the seller was a pleasure to work with. The recipient LOVES them and says they're the most unique candles she's ever seen. Very happy I found this shop!" Contact me if you'd like to order other candle colors, sizes, adornments, or quantities. Photos show candles from previous orders. Yours will be handmade to order especially for you. 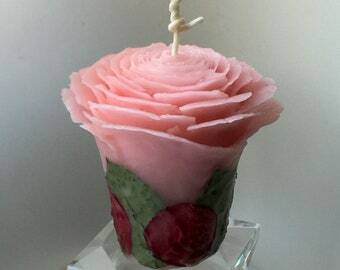 • ADORNED WITH: rose petals & leaves (choose petal color from drop-down menu...if you want each candle to have a different petal color choose "combination" and tell me the petal colors you want in the note to shop during checkout). Number of rose petals on each candle will vary depending on rose petal size. **Please note: I dry the roses in small batches year-round; available roses/petals at time of your order may look different than those shown. Holders are not included in the sale. Please tell me the date needed by in the note section during checkout. The current estimated production time for this item is listed in the "Shipping & Policies" section. Need candles sooner than what's listed? Contact me prior to purchase to confirm. Rush orders accommodated when possible (there may be an additional charge). TO ORDER IN LARGER QUANTITIES &/or OTHER COLORS: Contact me! WANT SOMETHING A LITTLE DIFFERENT? Contact me for custom orders. In my signature packaging: each candle in its own white gift box tied with tulle ribbon, and a Forest Candle Studio mini note card enclosed (candle info & burning instructions are on the back). See "Shipping & Policies" for PAYMENT & SHIPPING INFO for this item, and my general SHOP POLICIES. Ships via USPS Priority Mail with tracking & insurance, usually 3 days delivery time but can take up to 5 days. Overnight delivery via Express Mail is an available option during checkout for an additional charge. Rates shown are California to East Coast. For a quote to your location contact me. Otherwise, I will refund shipping fee overages to you via PayPal. Please bookmark or add my shop to your Etsy Favorites so you can find me again easily! Ordered two of these but both are in white but with different color pedals! Simply lovely. 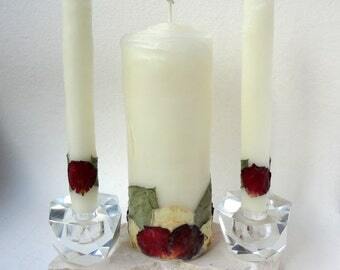 I have them in some vintage Princess House crystal pillar candle holders and they look amazing. I'm as happy as can be and a delightful shop and gorgeous product. Lots of love goes into these. Thank you Marcie!🌹🍃You will not be disappointed! This picture doesn't do it justice. These candles are a work of art. Marcie is amazing. She was on constant contact with me about my order, from beginning to end. We couldn't be happier with our purchase. My daughter's Quinceañera will be extra special! I am so happy with this pillar candle. It is so unique and beautiful. Payment must clear before your order will be made and shipped. I'll be happy to work it out with you! When I receive your payment I start work on your order, so if you need to make any changes (e.g., item, color, size, style, adornment, quantity) let me know asap so I can accommodate your request if possible. There may be an additional charge depending on what you request. If the changes you want result in costing less than you originally paid, only shop credit (no cash refunds) can be given for these changes to your order. • Custom orders decided on a case by case basis. • For all other orders if you cancel before I mail your order, you will be given shop credit for amount paid including shipping fee (less 25% of candle price restocking fee). AFTER YOUR ORDER HAS BEEN MAILED, no cancellations can be made. Please see the "returns/exchanges" policies below if you'd like to return or exchange your order. • ONLY USA orders are eligible for returns or exchanges. • Domestic custom orders are approved on a case by case basis. • PERSONALIZED orders are confirmed with buyer for accuracy before shipping and therefore are final sales and NOT eligible for return, refund or exchange. • INTERNATIONAL orders are considered custom made, are confirmed with the buyer before shipping, and as such are final sales NOT eligible for return, refund or exchange. I want you to be happy with your purchase (or gift)! To qualify for a return or exchange, all three conditions stated below must be met. PLEASE NOTE: Because of the amount of work and expense involved in making the candles, CASH REFUNDS are NOT GIVEN for returns / exchanges under any circumstances. • #1: If you aren't satisfied with your purchase for any reason, please CONTACT ME WITHIN 3 DAYS of receipt of your package so we can discuss the situation and find a solution. I'm available via email, Etsy conversation (aka convo) or telephone. My contact info is shown on the business card you received with your order, at the top of my Etsy "shop policies" page, on my "about page" in my Etsy shop, and at the bottom of each listing in my Etsy shop. You can also click "contact shop owner" on my Etsy shop main page or "ask a question" on any of my Etsy shop listing pages. • #2: You must get prior authorization from me before returning your candle(s). As long as the candles are unused and in their original condition (new, resalable), you can return them for a shop credit (amount you paid less original shipping fee & 25% of candle price restocking fee) for an immediate exchange or a future purchase in my Etsy shop. If your replacement item(s) & their ship fee cost more than your shop credit I'll invoice you for that amount. If they cost less than your shop credit you can use the remaining balance on a future order. No cash refunds will be given for returns or exchanges. • #3: Buyer must mail back the candles to me in their original wrapping no later than 7 days after date received as shown on USPS tracking/delivery confirmation. Buyer pays for return shipping & MUST include tracking, delivery confirmation & full value insurance. You may reuse the original shipping box & bubble wrap if desired. Shop credit or the exchange items of your choice will be made/sent to you as soon as I've received the returned items & any monies due for the new items. If returned items are received in less than perfect condition, customer is responsible for any loss in value. Applies to USA & International shipments. Your candles are mailed to you fully insured. The candles are packaged carefully and it is very rare for them to be damaged in shipping. Please open your package as soon as possible upon receipt because shipping companies have time limits on making claims for damage or loss. CONTACT ME RIGHT AWAY if any item has been received damaged in shipping, or not received within the expected transit time. • If received damaged, give me a description via Etsy conversation, email or phone. TAKE PHOTOS of the candle damage and the packaging and email the photos to me asap (photo proof of item damage and of the interior of shipping box with its bubble wrap etc showing how item was packed is required to file a claim). • I will then file the insurance claim form online on your behalf with a written statement about the damage or loss. After the claim is filed, the insurance company may ask for you to fill out a short form via email verifying the damage or loss. If so, I'll let you know beforehand. • Meanwhile I will remake your candle(s) right away and ship them to you at no charge, or if you prefer a cash refund of your original amount paid (including ship fee) I will issue it to you as soon as I've received it from the Post Office or Shipsurance (Etsy's package insurance partner). Do not dispose of the damaged item(s) & packaging during the claims process (if you do, you will waive your insurance coverage, and your right to a refund or replacement). The claims process can take up to approximately 30 days (may be longer for international claims), so please be patient to hear from me as to what to do with the damaged item(s). Upon receiving your order it is placed in line with the rest of my orders. Each candle is made in stages with great care & attention to detail, often taking several days to a week or more to complete. Custom designs, colors, adornments, or other special requests may take longer. EACH LISTING SHOWS ITS CURRENT ESTIMATED PRODUCTION TIME in the "Shipping & Policies" tab. The turn-around time is updated as needed and depends on my work schedule at the time of your order. For weddings & prior to holidays please order early whenever possible! • If you need to receive the candles by a specific date, tell me in the "notes to seller" section during checkout. If needed sooner than the production time shown in the listing, contact me prior to purchase to confirm availability. • Rush orders accommodated when possible (there may be an additional charge). Your package will be shipped to the address on your Etsy receipt unless you've told me otherwise. International orders must be shipped to buyer's address. All orders ship via US Postal Service (USPS), fully insured, with tracking & delivery confirmation. Shipping via UPS and FedEx is available by request. Contact me for rates and availability to your country if you don't see it in the listing you wish to purchase. EACH LISTING shows the current production time & shipping fee for that particular item. Please allow for possibility of longer transit time during winter holidays or stormy weather delays. • Delivery time approx 2-3 days, but can take up to 5 days. • Overnight delivery via Priority Mail Express available for additional charge. • Rates shown are from California to East Coast. If you'd like a quote to your location contact us. Otherwise, we will refund shipping fee overages to you via your original payment method. Contact us for current info on availability & requirements for shipping to you internationally. • Prior to purchase contact me for a quote to your location and I'll set up a reserved listing for you with the items you want and adjusted shipping fee. PLEASE NOTE that to allow enough space around your candles to protect them in transit, some items cannot be packed together to ship economically (surcharges for large boxes are costly). In these cases the items will ship separately (as already charged for in each item listing). Please contact me if you have any questions regarding use, care, or display of candles you have ordered from me.